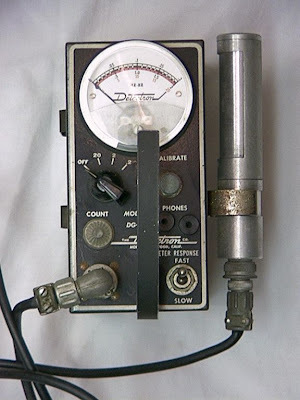 "My labmate was in lab one weekend and thought the Geiger counter was acting funny, so he called EH&S (Office of Environment, Health, and Safety) to see if he could get a replacement, forgetting that on the weekends, calls to EH&S are automatically rerouted to the police. He told them, "Yeah, I think the Geiger counter we have is broken and I just wanted to do a sweep of the area to make sure there weren't any spills..." And they were all, "We're coming in!" They stormed the building in hazmat suits and made him take off all his clothes to check for contamination. They wouldn't let people onto the floor. By the time I came in, there were 2 police cars, 1 firetruck, and an ambulance COMPLETE WITH PARAMEDICS STANDING AT THE READY WITH A STRETCHER outside. A hazmat suited guy finally let me into lab and there was my labmate, rocking back and forth in the corner... wearing nothing but a lab coat." Awesome. That beats the time our Geiger counter was acting funny... turns out the door to the adjoining lab wasn't radioactive, it was the person working at the fume hood on the other side who'd recently had a liver biopsy done that included injections with radioactive markers. She was making our counter scream, but at least I didn't have to decontaminate the area.